My thesis defence is scheduled for 3th November, 12h, IST – Alameda. Disc-jockeys have come a long way, through technological evolutions. This path led them to the status and recognition they have achieved in our society. But as impressive as those technological evolutions are, as far as DJing is concerned, there are still few applications that support hands-on interaction over virtual DJ applications, and those are typically reduced to the traditional input devices. Furthermore, recent proposals apply new DJ metaphors, but are not successful in maintaining coherence with traditional DJ lexicon of gestures and concepts, thus requiring an extensive learning period. Accounting user feedback from an accompanying group of DJ experts, we devised a multitouch solution that maps physical core DJ concepts into a virtual application. In the proposed solution, gestural interaction from Traditional Setups remains coherent while inheriting advantages from the virtualization of the DJing domain. The system addresses typical requirements of contemporary DJing, as identified by our research, namely: robustness, low-latency, external control, adaptability, audio plugins and connectivity standard-compliance. Additionally, we support task improvements, such as dynamic re-routing of music flow, seamlessly merging edit with DJ-performance mode and rearrangement of interface layout according to user needs. Our system allows DJs to exercise creativity with a natural interaction, creating scenarios that are not possible in the real world. 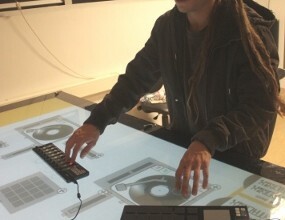 Comparison against Traditional, Virtual and Hybrid DJ setups showed how a multitouch DJing surface developed with DJ involvement, can suit experienced users changing to Virtual setups. By the way, due to popular demand, here’s the final grade I got on the Master thesis: 19 (out of 20) or A in ECTS terminology. Thanks to all that supported my research. © 2019 pedro lopes music & performance some rights reserved, except where noticed otherwise (see here).